Story: Coming off his amazing work with the Avengers in Civil War, Peter Parker is sure that he’s thisclose to joining the gang. But he’s got high school to get through, and there’s a high-tech guy starting to make trouble in Petey’s neighborhood. Yo, home to … Queens! Remake, Sequel, Based-On, or Original: Based on the Spider-Man comics originated by Stan Lee and Steve Ditko. Part of the MCU (Marvel Cinematic Universe) of films. Gotta say: I absolutely adored the way the MCU used Spider-Man/Peter Parker in Civil War. It was just enough to get Spidey fans like me jazzed, with no overkill just because they had the rights. 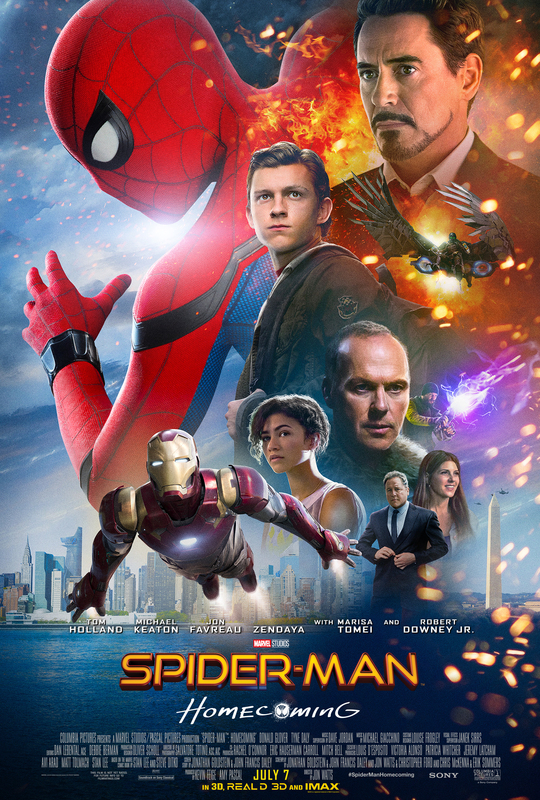 Here with Homecoming, Peter gets his stand-alone story, and Holland, director John Watts – along with a cast of screenwriters – and the MCU in general do the web-slinger right. Why am I dragging the MCU in this? Well, because while Peter isn’t a part of the gang officially, his story definitely has ties to the overall MCU. First off, there’s surrogate dad Tony Stark, who helps Peter with superhero growing pains. Then there’s Happy Hogan (played with disgruntled-uncle resignation by Jon Favreau) on babysitting duty, and an absolutely fantastic Petey POV scene from Civil War that’s firmly tongue-in-cheek, but plants Peter Parker into the millennial/social media generation. It’s a perfect way to bring the character into the 21st Century, and it’s also a whole lot of fun. Things could have gotten a bit too John Hughes (or Guardians of the Galaxy) with the funny banter and rapid-fire dialogue…but casting Michael Keaton as Vulture keeps things grounded. Not only did I enjoy the sly wink to old-school superhero movies – not to mention Birdman – but Keaton’s gravitas lends dramatic heft to the storyline. Keaton’s Adrian Toomes isn’t just a Big Bad, he’s a guy just trying to make it, getting sick of the 1% crapping all over his parade every time he gets a break. And if that’s not a currently relevant bit of mitigating circumstance, I don’t know what is. Not to say that Toomes/Vulture gets a pass; he definitely loses a chunk of his humanity as things go down. But Keaton’s ability to add pathos and genuine earnestness to the character brings a fully-fleshed baddie to the table, and when things go down it’s really worth watching. As for Peter and his high school gang, as best friend Ned, Jacob Batalon steals every scene he’s in. Coming in a close second is Zendaya as Michelle, the goth/loner/clique-less gal who thinks Peter might be hiding something… And as Peter’s crush Liz, Laura Harrier is adorable, but has a brain on her too. Thank goodness. Cinematography, art direction and FX are top-notch here. From Peter and May’s apartment to a dusty junkyard, things are sharp, colorful without being gaudy, and gorgeous to look at. Yes, there are the required “Spider-Man view of things” shots, and they’re breathtaking, as are the swinging from building-to-building shots. But even scenes in the high school, and at Peter’s friend’s houses, are just as gorgeous. I wanted to spend time in those sets, and really take a look around. Perhaps I will when the Blu-Ray hits. And lastly, I love the lighter tone to Spidey here in Homecoming. While earlier iterations with Maguire and Garfield were fun because Man In Suit, this Peter Parker isn’t as dark. Sure, he’s a teenager and that’s rough. And he’s fighting bad guys, which isn’t a bowl of cherries. But this Peter is joyful, excited to be a part of things, and isn’t saddled with the “working class schmo” archetype (or if he is, it’s not something we’re hit over the head with.) Peter’s joy bleeds into the story, and that feeds the audience. It may not be easy being Spidey, but it sure can be fun. And don’t we all deserve a little fun? #Protip: If you’re headed out to see Spider-Man: Homecoming this weekend (and c’mon, if you’ve gotten this far in my review you definitely are), don’t forget to send good thoughts and lots of love to Stan Lee, who lost his beloved wife Joan last night. They were married in 1947, and had been together ever since. RIP, Joan. This entry was posted in 7 Pieces Of, Movie Reviews and tagged 7 Pieces Of, MCU, Movie Reviews, Spider-Man, Stan Lee. Bookmark the permalink.